Got Resolutions? 5 Goal Setting Apps To Help You Achieve Yours! Have you resolved to save more money? Eat healthier or lose weight? Even though many of us make New Year’s resolutions, US News & World Report says that 80% of resolutions fail by the second week of February. While that maybe true, there are ways to significantly improve your odds of success. A study by Dr. Gail Matthews at Dominican University in California found that writing down your goals contributes to a 42% increase in goal achievement over those with unwritten goals. When you add accountability to your goals (i.e. break down goals into actions, make a commitment to a friend and provide them with weekly progress reports) that increase in goal achievement jumps to 78%! When you put your resolutions into one of these goal setting apps, you’re not only writing them down, you’re setting up accountability by breaking them down into actions and tracking your progress. Try one of these 5 goal setting apps and achieve your resolutions this year! 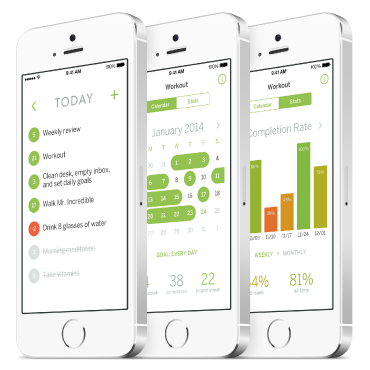 Strides is one of the more powerful and easy to use habit tracking and goal setting apps. Strides uses the S.M.A.R.T. goal setting method so you set specific, measurable, achievable, relevant & timely goals. Its four different trackers (Target, Habit, Average & Project) track different types of goals or habits. You can even create your own tracker. It has reminders so that you don’t forget to complete the daily habits that lead to achieving your goals. The basic Strides app is free, but to get great features like unlimited trackers, tags & filters, today list and export data, you’ll need a subscription ($4.99/mo or $39.99/yr). 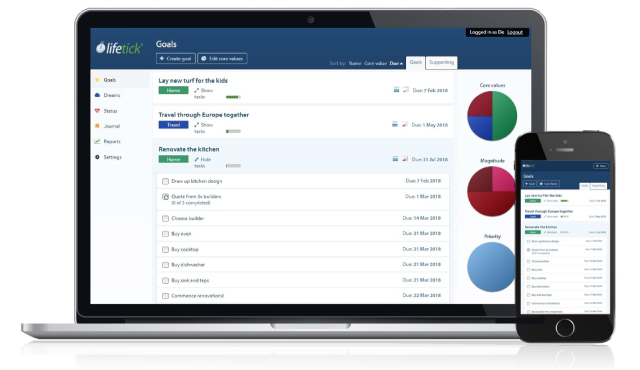 GoalsOnTrack is one of the most robust goal setting apps and also uses the S.M.A.R.T. goal setting method. You can break your goals up into smaller chunks, break long term goals down into milestones or sub goals and organize them with your own categories. GoalsOnTrack has a vision board tool where you can upload your own pictures and music to create an animated slide show for your visualization practice. It also has an integrated calendar and journal for creating an action plan, as well as an offline planner for printing. To make consistent progress, nothing beats good habits that support your goal. 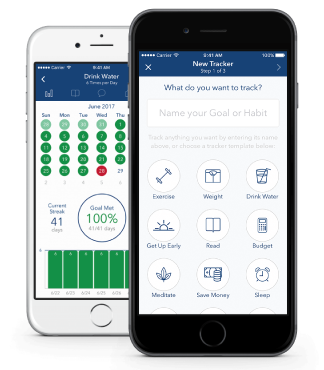 GoalsOnTrack can help you build good habits and link them to support your goals. Membership is $68 per year. With LifeTick (another app that uses the S.M.A.R.T. method), you start by defining your core values from which you develop your goals. You then add tasks or steps to achieve that goal. This app provides an activity feed, creating a date-sequenced journal of all your goal related activities. Unlike Strides and GoalsOnTrack, LifeTick allows you to ask others to view your progress towards your goals and can add comments to keep you motivated along the way. They have plans for individuals, business, and families. If you want to try the service, the free version supports up to 4 goals. The paid version ($20/year) allows unlimited goals, the journal tools, and live stats widgets. This app helps you track your “streaks” – or how many times in a row you complete a habit. You create a flexible schedule for your habits that are done on specific days or intervals. Then Habit List shows you what’s due that day … no need to wade through your entire list. It helps you stay on track with reminders and shows you trends over time so you can see the bigger picture of your progress. 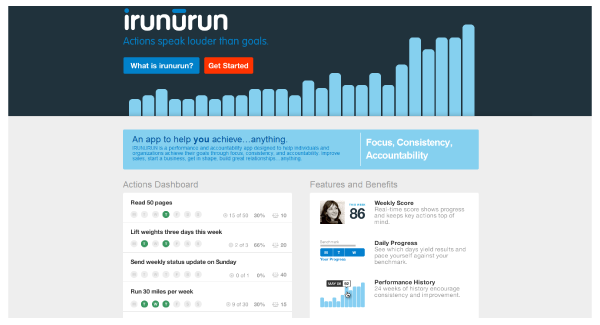 A performance and accountability platform for reoccurring behaviors, Irunurun makes goal setting fun by making the process of building new habits a game. Once you enter the action or habit you want to track, you assign it a point value. The game begins once you’ve completed this process for all your habits or actions. You start off each week with zero points and then work to add points each day. You can earn a perfect score of 100 by doing each action at the appointed time. To build an accountability team, you can invite your friends, family or colleagues to any action. This is one of the more fun goal setting apps! Which of These Goal Setting Apps Is For You? While you probably won’t find the perfect app that encompasses all your needs, any of these goal setting apps can help you improve your life and accomplish your most important goals. Start by choosing one that fits your needs the best and experiment with it. Even if your first choice doesn’t quite fit your needs, it can help you narrow down the important factors. Whatever you decide to commit to, the important thing is to use the energy of the new year as an opportunity to make important changes for your health! The holiday season is here, making it a great time to invite friends & family over for a holiday party. Whether you host a holiday party every year or it’s your first one, here are some tips to help you plan a party that’s fun, festive and budget friendly. List potential expenses, such as invitations, decorations, entertainment, food and drink. If you’re not sure how much each item will cost, look online for estimated pricing. If you’ve hosted a holiday party before, review expenses from previous years. Also, programs such as Party Budget Estimator from Evite calculate your costs based on information you type in, the number of guests and duration of the party. Prioritize where you’d like to spend most of your money. Is the food the most important aspect to you, or is it mood-enhancing items like decor? Once you estimate how much everything will cost, you can decided how you would like to prioritize your spending if you’re on a tight budget. Although your budget may dictate the size of your holiday party, there are ways to cut costs so you can entertain more people. Are you planning a sit-down dinner party or something larger? Are you inviting families or adults only? If you’re inviting children, keep their interests and ages in mind as you plan activities. For example, be sure to have entertainment available to them, such as holiday movies in a playroom, holiday themed games, toys, etc. Sending Paper Invitations? If you plan to send paper invitations, be sure to send them as soon as possible. Schedules fill up fast over the holiday season, so be sure to invite your guests several weeks in advance. Email Invitations. These are free to send and allow you to easily manage who has responded and who hasn’t. If you use Facebook, create an event page to invite guests and communicate with them before the event. This is especially useful if you’re planning a potluck or are asking guests to bring snacks or beverages; you can ask people to post what they’re bringing to ensure there’s no overlap. Make sure your guests have fun at your holiday party. Use a digital music service such as Pandora to choose holiday-themed playlists or create a music list with a digital service like Spotify. Karaoke Anyone? If your guests love singing, buy, rent or borrow a karaoke machine and queue it up with holiday hits. Offer a prize for the best singer to encourage healthy competition. Festive Attire! Encourage your guests of wear festive attire like (ugly) holiday sweaters by offering a prize. Have Santa Join The Fun. Ask a friend or family member dress like Santa Claus and hand out candy to guests or small toys to their children. Create Goody Bags! This is fun if you have young children at the party. Include candy canes, crayons, holiday-themed coloring pages or books and stickers. This will keep them busy while their parents mingle. Exchange Gifts. Make it a Secret Santa or While Elephant exchange and give guest a budget to adhere to. For a Secret Santa exchange, pair people up ahead of time, once you know who’s coming to the party. Whether you’re having your holiday party catereted, making everything yourself or having a potluck, it helps to plan ahead. Catering In? Hire a caterer as soon as possible since the holiday season can be their busiest time of year. Look online or get recommendations from friends for great caterers in your area. Once you’ve hired one, work with them to create a holiday party menu your guests will love that also takes into account any dietary restrictions your guests may have. Cooking Yourself? Scour the internet and your favorite cookbooks and magazines for recipes. To save time and avoid stress, make as much of the meal as you can in advance and freeze it, Or, host a holiday party buffet instead of a sit-down meal. People tend to eat less at a buffet and you can make most of the food ahead of time. Another idea? Host a brunch instead of a big dinner. Since breakfast items tend to be cheaper, you’ll cut down on food costs. Planning a Potluck? Supply the main dish and ask your guests to bring their favorite dish to share. To avoid doubling up on dishes find out ahead of time what they plan to bring, If they’re not sure, give them a recipe to make of if they don’t cook, ask them to bring beverages or ice. Creating a Signature Drink! Serve a drink such as eggnog or a seasonal cocktail. Buy non-alcoholic beverages in bulk, such as soft drinks, water or apple cider. Your holiday party decorations don’t have to break the bank. Reuse old decorations to save money or borrow decor from family or friends. If you have children, enlist their help to get creative. Decorate natural items such as pine cones and branches with glitter. If you prefer to purchase new decorations, discount stores offer a selection of low-cost, festive items. If you tend to hold a holiday party every year, be sure to take advantage of post-holiday sales and other deals throughout the year. Before you save goodbye to your guests, here are three thoughtful ways to thank them for coming! Buy Food Storage Containers. Send people home with leftovers and treats. They’ll appreciate the gesture and you won’t have a refrigerator overflowing with food. Did You Use Centerpieces or Flowers? You can send them home with a few of your guests or use them as prizes. Take Pictures! If you have a Polaroid or other instant camera, take photos throughout the party. You can also set up a photo booth for guest to take pictures of themselves. Allow them to keep the photos, or send them a copy with a handwritten note after the party. Is Your Family At Risk of Child Identity Theft? No one wants to go through the fallout from an identity theft. It’s incredibly stressful, it can be costly, and it can take what seems like forever to get your record clean again. By gaining access to your personal information, the identity thief can send your finances, credit, and your reputation into a tailspin. When criminals steal your personal information for their own financial gain, it’s identity theft. It can include everything from stealing someone’s social security number to open new accounts to hacking into a bank account. Because so much of our information is now stored and shared electronically, this crime is on the rise – and child identity theft is happening more frequently, too. It’s easy to forget that your children can also be the victims of identity theft, even without credit cards or bank accounts of their own. Today, we’ll walk you through the basics of child identity theft, signs it may have happened to your family, and some tried-and-true ways to make sure you’re keeping your family as safe as possible from child identity theft. What Makes Child Identity Theft An Appealing Crime? A child’s information gets shared on a regular basis. Think of all the times you’re required to share your children’s information: their schools, your work, and much more. Additionally, kids are known for hopping on social media without realizing the risks of sharing their own personal information. These realities can make your child’s information much easier to access. A child has no negative credit history. Of course, most children have zero credit at all! This means it’s much easier for identity thieves to take out new loans in your child’s name and commit child identity theft. A child’s credit information isn’t monitored. Years may go by before you realize your family is the victim of child identity theft. While there’s no foolproof way to prevent child identity theft, there are ways you can be alerted that his or her information may have been stolen. You receive credit card applications in your child’s name. This could mean someone has used your child’s information to apply for credit. A collections agency calls to speak with your child. The IRS tries to contact your child. Someone could be using your child’s social security number. Your child is turned down for financial aid, first apartment, or a job. If your child is getting refused because of a bad credit history, it could be a case of identity fraud. Many cases of child identity theft come to light only when child applies for college or a job – likely the first time anyone runs a credit check. When it comes to child identity theft affecting your family, you’re not limited to simply crossing your fingers and hoping for the best. There there are steps you can take to protect your child’s information and credit. Equip your kids with online safety smarts. Talk to your kids about the risks and pitfalls of sharing too much information, making purchases from unsecure websites, online scams, etc. Be careful with your child’s information. For instance, don’t carry your child’s Social Security card in your wallet – store it in a safe location with other important documents. Keep your child’s information as private as possible. Unless it’s absolutely necessary, don’t share your child’s private information (Social Security number and date of birth) to anyone. Check your child’s credit reports. Because your child shouldn’t have a credit report at all, you can use an annual credit check to easily verify whether someone has tried to obtain credit using your child’s social security number. Realizing your child’s clean credit history has been ruined is a terrible feeling. It can result in you and your family feeling blindsided. Now that you’re equipped with today’s tips and insights, you’re far more likely to discover the child identity theft right when it happens, or hopefully, avoid it altogether. Disclaimer: Citywide Home Loans does not provide identity theft services or any other service apart from lending.